This past March, three architecture studios—35 students, along with multiple faculty members—spent a week in Taipei as part of the Rubin Global Design Studio, an annual architecture travel program. They are led by Syracuse Architecture faculty members, including Angie Co, program coordinator for architecture studies at the Fisher Center in New York City; Jimenez Lai, a visiting critic for the spring semester, currently an assistant professor at the University Illinois-Chicago; and visiting critics Dwayne Oyler and Jenny Wu of Oyler Wu Collaborative in Los Angeles who both teach at the Southern California Institute of Architecture. The studios are working collaboratively with architecture students from National Chiao Tung University in Taiwan and Hong Kong University to develop design proposals for the Taipei Train Depot site, situated in the Xinyi district of central Taipei. This unique educational program offers students the opportunity to create new collaborations and partnerships focusing on real-world urban issues and problems, functioning as a kind of global office, in one of the most dynamic and architecturally rich cities in Asia. 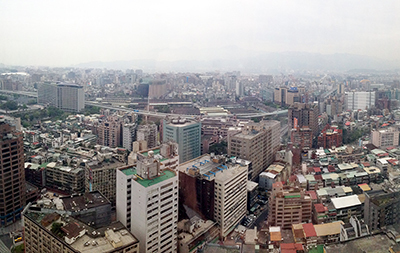 Taipei was recently named 2016 World Design Capital. The trip was made possible through the support of Todd Rubin ’04 and the Rubin Family Foundation. Rubin, a member of the School of Architecture’s advisory board, has sponsored previous trips as part of the Rubin Global Design Studio at the school. In the spring of 2013, students in visiting critic studios traveled to Baku, Azerbaijan, and in 2012, to Copenhagen, Denmark. Student work from the Syracuse studios, as well as from NCTU and HKU, will be exhibited at the Syracuse University Fisher Center in New York City beginning Friday, May 2. 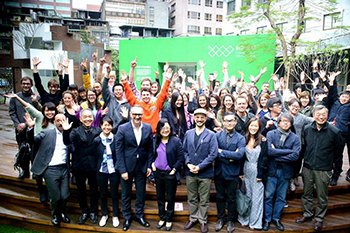 On May 2, there will be an exhibition opening reception and on Saturday, May 3, the school will host a symposium with a panel discussion devoted to the many urban and architecture competitions that have occurred in Taiwan in the last 10 years, as well as a session that will explore the collaborative learning and partnerships that emerged from the five studios working together on the Taipei project. Participants will include Neil Denari, winner of the Keelung Port Competition; Jesse Reiser and Nanako Umemoto, winners of Taipei Pop Music Competition; and David Tseng, dean of the College of Arts and Humanities and Social Sciences at the National Chiao Tung University in Taiwan. Syracuse University opened the Fisher Center at 136 Madison Ave. in January. The state-of-the-art renovation includes studios, lecture and classroom spaces, as well as faculty and staff offices for the School of Architecture in addition to the University’s performing arts programs. Fisher Center architecture events are free and open to the public, but seating is limited. To R.S.V.P. for the May 2 exhibition opening reception, visit http://bit.ly/1poxTd9 and for the May 3 symposium, http://bit.ly/1fllfBO.